Starting next week Writing Studio tutor Josh Lehman will be a regular fixture here at the Nielsen Library. 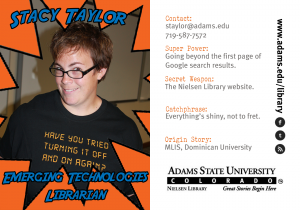 Josh will be set up on the second floor of the library Tuesday, Wednesday, and Thursday evenings from 4:00pm – 9:00pm. The K2 Coffee Lounge will be open until 2am, serving up coffee, tea, and more! 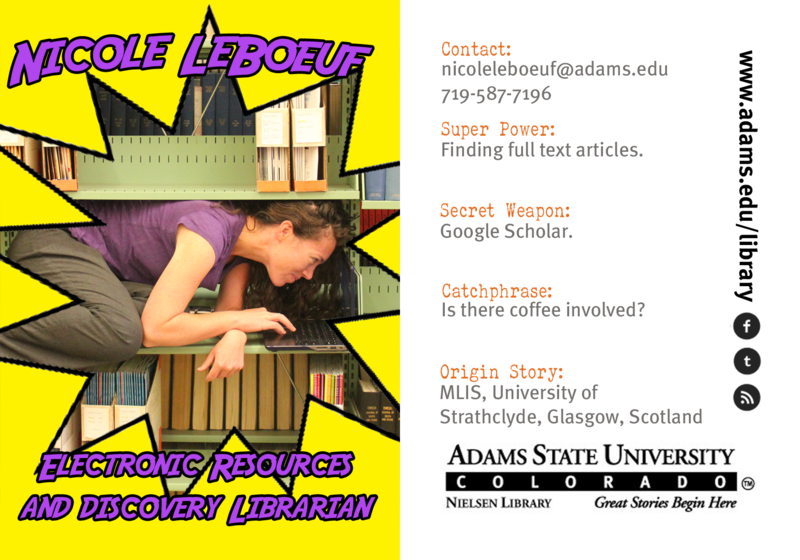 Come to the reference desk and get a voucher for a free hot beverage while supplies last. 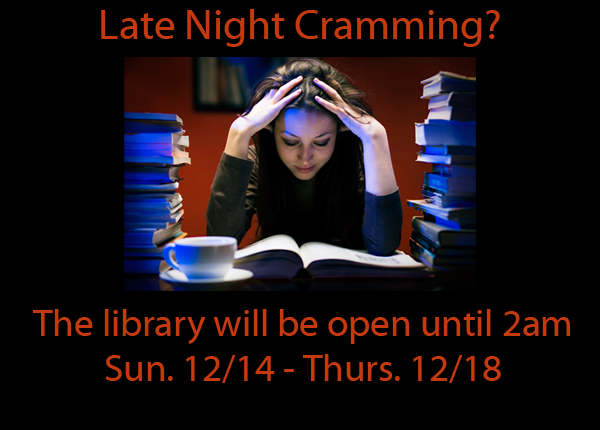 Due to the overwhelmingly positive response to last May’s late night hours, the Nielsen Library will once again be staying open late during finals week. We’ll be open until 2am Sunday, 12/14 – Thursday, 12/18. 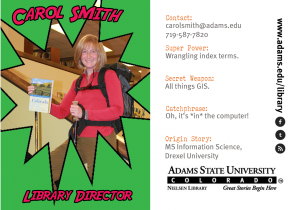 With finals fast approaching the library staff is hitting the road and heading to a building near you. 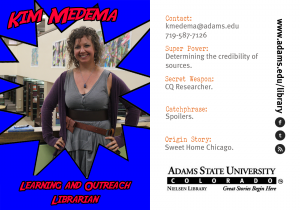 From December 8 – December 15 librarians will have tables set up in various buildings around campus. 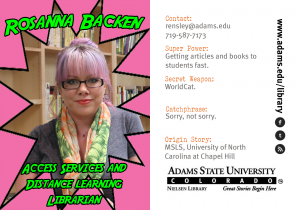 We’ll be there to help with research, citations, looking up books…any service we normally provide at the reference desk. Stop by and ask us anything! 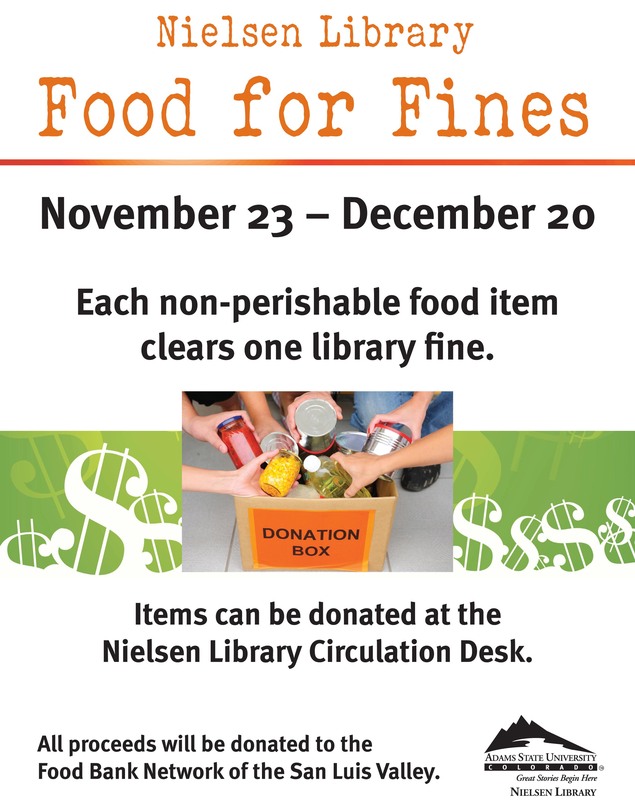 Bring non-perishable food items to the Nielsen Library from November 23 – December 20 and get rid of all those pesky overdue charges! 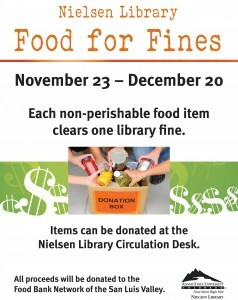 Each non-perishable food item is good for waiving $5 in late fees and there is no limit. 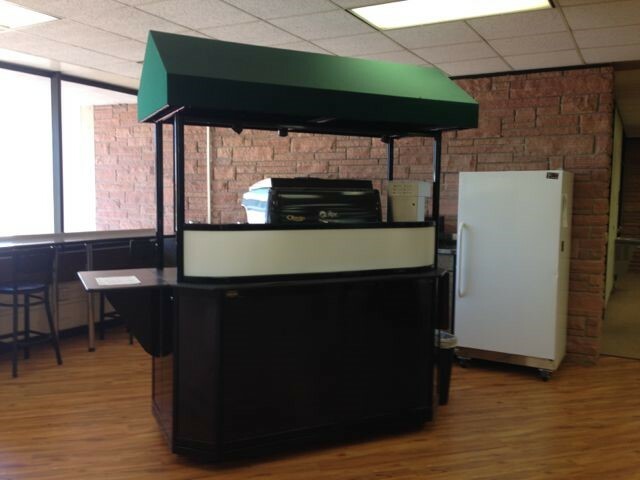 All food will be donated to the Food Bank Network of the San Luis Valley. 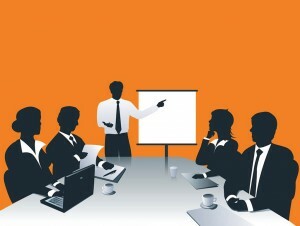 Do you have a big presentation coming up and need a place to practice? 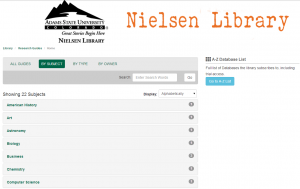 Did you know you can reserve any of the Nielsen Library’s classrooms? 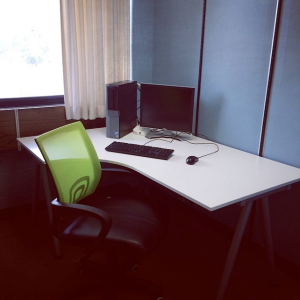 Classrooms may be reserved for presentation practice, group study, and more! Rooms 315 and 316 have computers and SMARTboards, and room 317 has a computer and portable projector. You can also reserve the Cooper Room, which has a conference table and large screen TV with HDMI hookup. 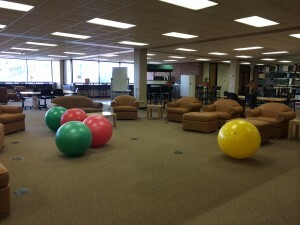 The Cooper Room must be reserved in advance, but classrooms can be used anytime they’re not reserved by another group. For more information, see our Room Reservations page. Email Stacy Taylor to reserve a room. Are your textbook bills overwhelming you? 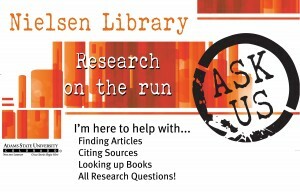 Did you know that the Nielsen Library has copies of some textbooks in the Reserves Collection? To see if we have your textbook, search the library catalog by course number or professor. 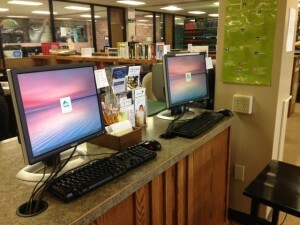 Reserves are kept at the Circulation Desk on the first floor of the library, and can be checked out for 1 hour. Unfortunately, we don’t have copies of all textbooks. If there’s a particular text you’re looking for, ask your professor about putting it on reserve for your class. Professors – do your students a favor and put a copy of your text on reserve. 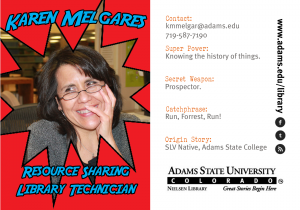 Check our Reserves Information for Faculty webpage for all the details. 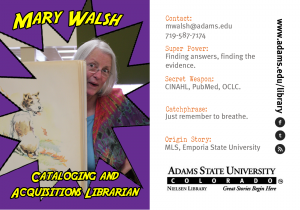 Have you seen the Nielsen Library staff’s new trading cards? 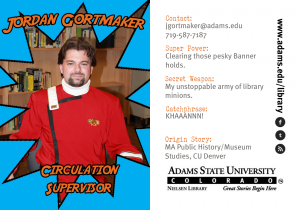 They’re available at the circulation and reference desks. 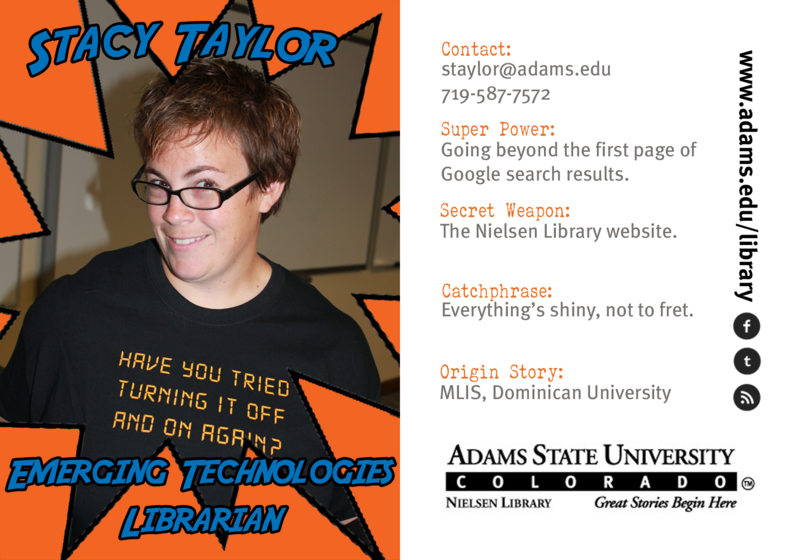 Collect all 8 and get to know the library staff a bit better! 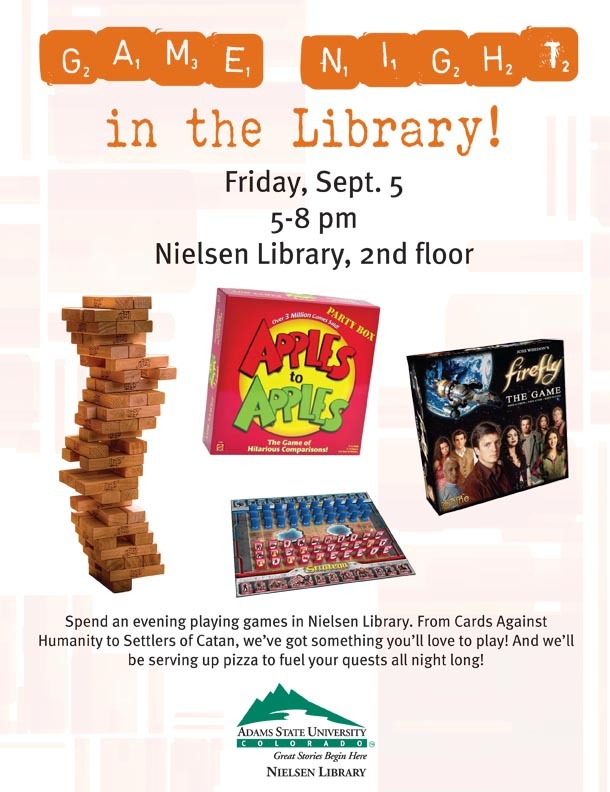 We spent the summer hard at work making all kinds of improvements in the Nielsen Library, and we hope you’re as excited as we are. 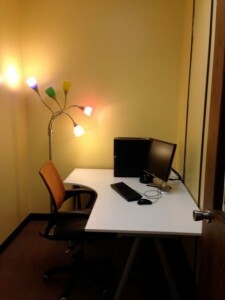 All individual study rooms got a fresh coat of paint, new desks, new chairs, and new lamps. A huge shout-out to Karen Melgares, Jordan Gortmaker, and Ronnie Medina for all their hard work. 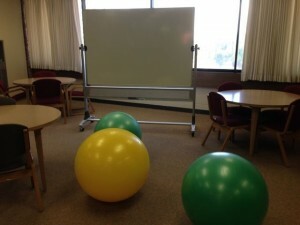 There’s also lots of new yoga balls and whiteboards throughout the building. 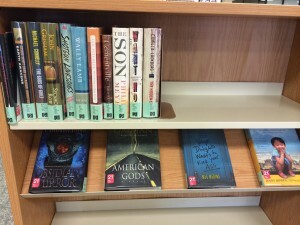 Feel free to move them around – it’s your library! 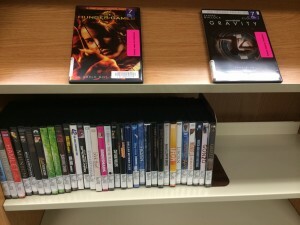 We’ve added popular books and popular DVDs to our collection, along with phone and MacBook chargers for use in the library. 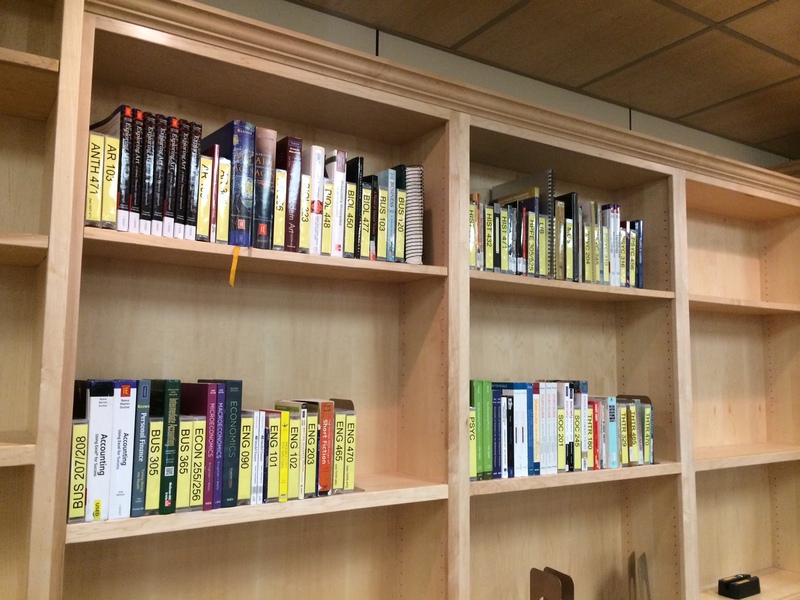 Our reserves section has been completely cleaned up and rearranged. 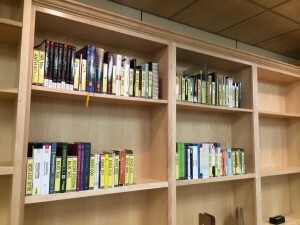 Textbooks are now organized by course instead of professor. 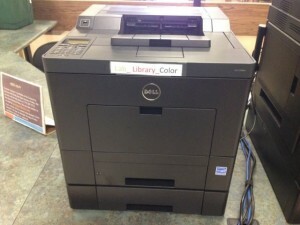 There’s a new color printer in the second floor computer lab, and Chromebox computers for searching the catalog and databases. 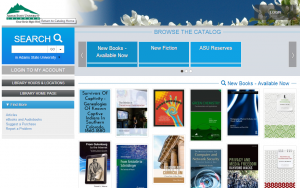 Speaking of databases…we’ve added new electronic databases, including ProQuest Dissertations and Theses. Plus…this fall we’ll be introducing our technology collection, with tablets, eReaders, a smartwatch, a GoPro, and much more! Our Research Guides, Catalog, and Blog all got major facelifts this summer. All of them have a responsive web design so they’re easier to use on mobile devices. 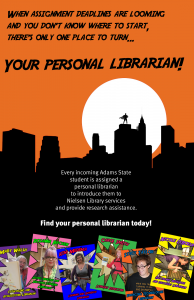 We’re introducing a personal librarian program, in which every incoming student is paired with a librarian to provide individual help with research and library services. We’re also increasing the number of events at the library, starting with a game night on September 5. We’re re-branding and orange is our signature color. And we have lots of cool new stuff to give away. 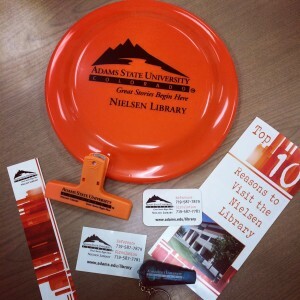 Look for orange signs in the library and around campus. 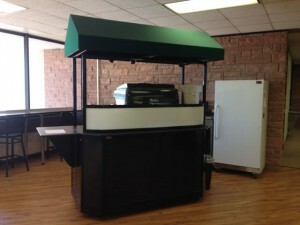 We are extremely excited to announce that after more than two years of sitting forlornly in the corner, the coffee cart will be reopening this fall! 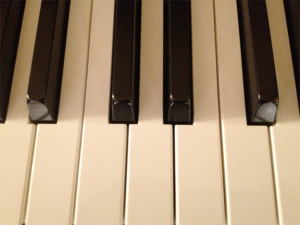 We’ll also be getting a piano on the second floor for after hours events and the occasional concert during low-traffic times. 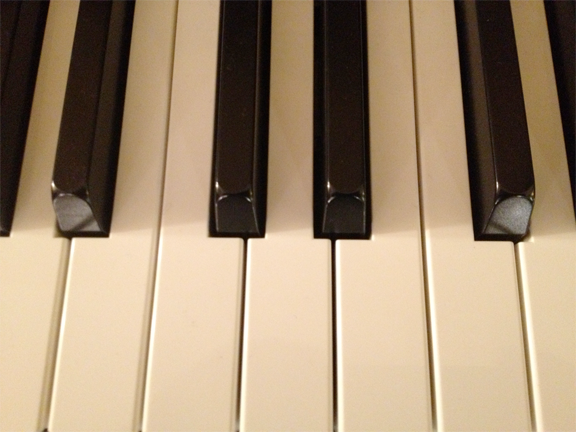 Don’t worry, we promise not to make a racket during finals week. Nearly all of these changes are a direct result of YOUR feedback! We really do listen to what you have to say, so let us know what you’re thinking. Comment on our Facebook page, send us a Tweet, comment on this blog, fill out our online suggestion form, or use the suggestion box on the third floor, answer our weekly whiteboard questions, or just stop and talk to us. Looking for books? 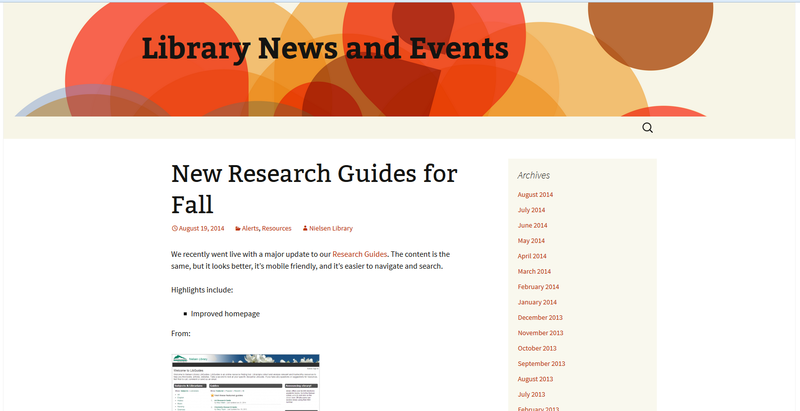 Our beta library catalog has a bunch of new features – try it out and tell us what you think!